I’m teaming up with Nordstrom today to share this easy + chic look. 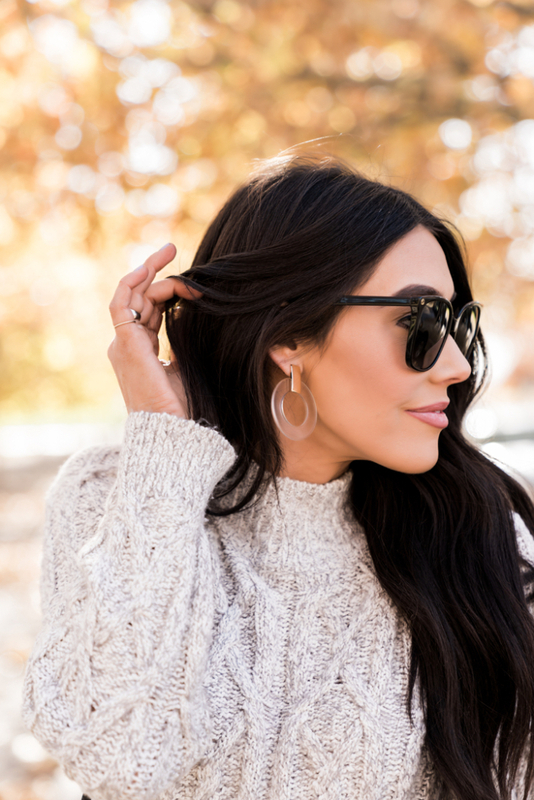 I’m pairing this comfy sweater dress with a couple of my top accessories! 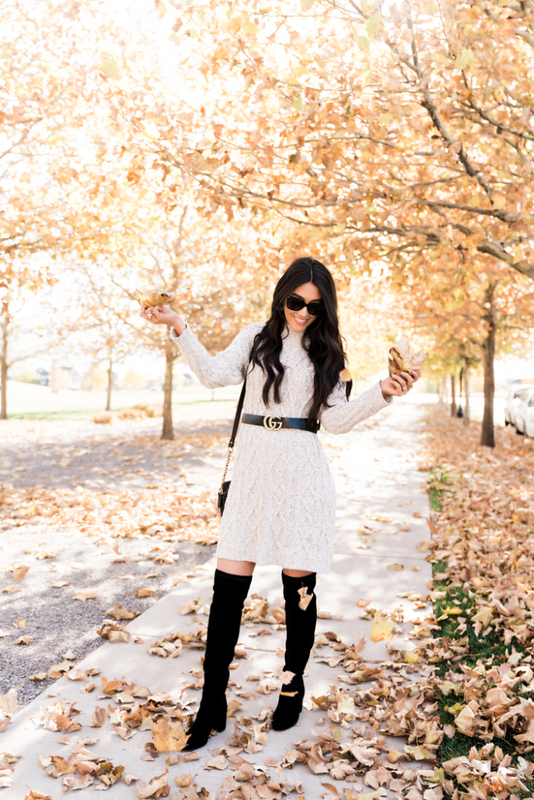 I also have another post all about sweater dress and some great picks here. I love dressing up my outfits with simple accessories. Nordstrom is alway my one stop shop to find everything I need for any outfit on both the high end and more affordable price levels. This belt is one of my all time favorites from Nordstrom because I’m able to wear it so many ways – and it looks super cute on my baby bump! I’m also loving the OTK Boots again this year (these ones are on sale) – there is a post all about them right here. I feel that they are great to pair with any outfit that is a little more simple for a good pop of style. Last but not least I’ve also been loving Nordstrom’s selection of earrings this year! 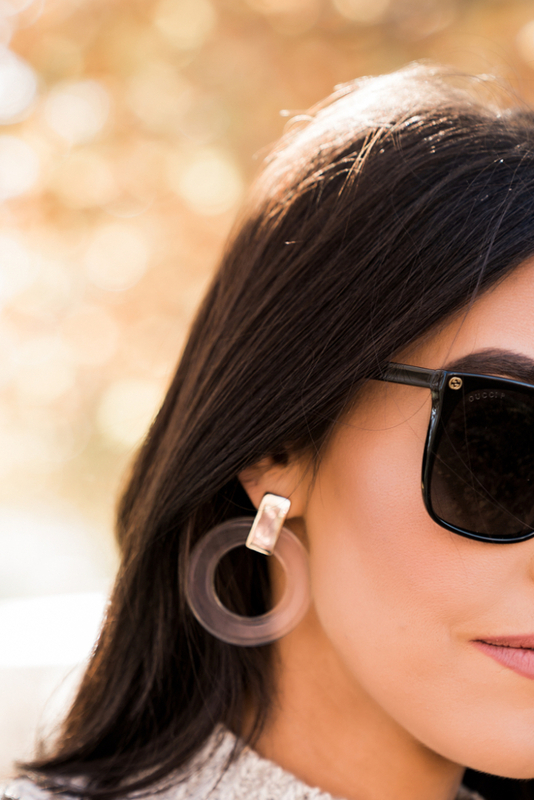 I’m a sucker for cute earrings and they have some of the prettiest ones right now! Thank you so much Nordstrom for sponsoring this post! All thoughts and opinions are my own. Can you spot the bump?! Oh here is there and getting bigger and bigger everyday. I can’t believe in a few short months we will have a little man join our family. Baby boy is growing great and keeps me tired, all day long, haha! My babies can hardly wait and ask how the baby is doing everyday. I have to admit, being pregnant and having two toddlers to keep track of has definitely been a little more difficult than my previous pregnancies. I catch myself wanting to take more naps throughout the day, but don’t have enough time to do so! It’s just part of being a mom! I am super lucky with my pregnancies. I typically don’t get too nauseous or sick. I do get bad back pain and occasional headaches which I would love to not have but unfortunately, you can’t really pick and choose in this situation. What’s helped me a ton is drinking water and getting to bed as early as possible. I am thirsty all day, so I keep lemon water close by so that I can hydrate every few minutes. Also, baths are a complete life changer. I am a big bather. My whole family is, haha! When my back is just absolutely killing me, nothing makes me feel better than taking a warm bath. It’s so relaxing and helps relives any back pain I have. If you don’t typically take baths, now is the time! You have no idea what you’re missing. 1. Going to bed early. I really try to be in bed before 10. I NEED my sleep. I wake up pretty early, so I know my body needs to rest to grow this little angel boy. This has helped me feel so much more rested and have more energy throughout my days! Which is something I’m desperately in need of right now. 2. Relaxing as often as possible. Whether this is just waking up early in the morning, drinking some tea, cuddling up with a book or just “resting my eyes” on the couch for a few minutes! I’ve been more mindful of taking a few extra minutes for myself and not over doing it. 3. Keep snack around! Snacks are my jam! I have to snack all day long. It helps me have more energy throughout my day and not have moments where I feel like I just want to crash! I keep small snacks in my car while I’m driving my babies around to different activities. Anything from nuts, to fruit, crackers, cheese or anything that’s easy to throw in my bag! 4. Don’t sweat the small stuff. I really have lacked energy this pregnancy and I haven’t been able to keep a handle on everything in my life. I’ve had to learn to be ok with things not being perfect all the time. And it’s actually been super refreshing. That’s all the updates I have for you so far! I’m sure that things will change within the next few months when little man really starts to grow!